Holy Oranges Batman! Our house has been the location of many an experiment and lately, oranges are finding themselves all over the place. Being who I am, there's no way I can let that many orange peels pass through my hands without trying to figure out a creative, delicious use for them. Rather than zesting the buggers and saving them for future use, like I did with my lemons, I decided it was time to candy some citrus peels and the results have been quite tasty...I'm sure, dipped in chocolate, they'd be even better, however we're just enjoying them as is. Thanks to a beautifully titled blog: Use Real Butter, I used this recipe and turned out a delectable little treat! Once you have lovely orange peels, throw them in a pot with cold water, bring to a boil, strain and repeat - you should do this a total of three times to eek out some of the bitterness. 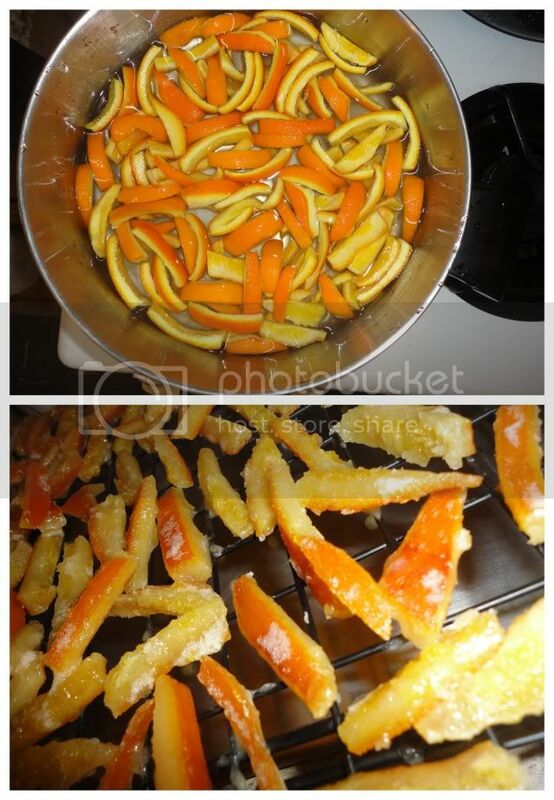 With your oranges in the strainer, it's time to get into the real deal of making candied orange peels. Bring 3 cups of Sugar and 1 cup of Water to a boil over high heat until you reach 230 F. Add the orange peels, reduce to a simmer and simmer until translucent (30-75 minutes depending primarily on elevation). Remove peels from syrup and set on a rack to dry 4-5 hours or over night. If you wish to roll them in additional sugar at this point, you are more than welcome to do so. Otherwise, enjoy as is after a few hours or temper some chocolate and dip away!